HomeBlogChoosing an MCA CRM? Avoid these mistakes! Choosing an MCA CRM? Avoid these mistakes! Let us face the reality; you do not want to make the mistake of picking up the wrong MCA CRM just like others. MCA CRM software can save a lot of your precious work hours, but then again, it comes at the price of a learning curve. 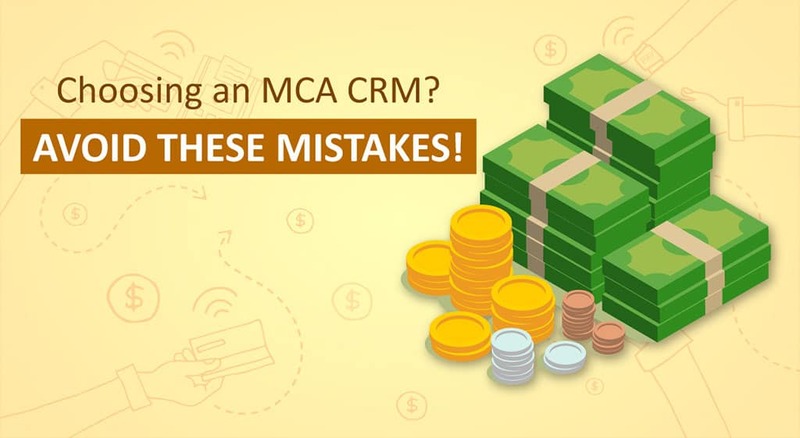 A learning curve that can make you shell out a lot of money, in case you have to change the MCA CRM platform down the line. For the convenience of such buyers of MCA Customer Relationship Management platform, we have put together a few ideas to mull over when choosing a CRM. Let us review them one by one now and we are hopeful that these suggestions will help. A specific or a niche solution may be perfect for your business if you are wishing to use the CRM solution at its optimal level. Now, if you are just utilizing your CRM platform for basic data input, you will definitely not benefit from such a high-powered customer relationship solution with myriad bells and whistles. However, if you are using the CRM solution to track multiple areas unique to your kind of business, such as retail, MCA, legal and others, you should consider using the appropriate niche CRM solution that fits with your business’s modus operandi. Once you purchase a CRM platform, it is most likely that you are not going to be the only one who will use the CRM system. Therefore, before buying a CRM, you will have to take time out to consider the needs of the other users who will use the CRM along with you in your company. Never run into a risk of fully investing in a particular software solution that will only reward you and your executives, but your evaluation of the CRM platform should take into consideration the cross-section of all the users who will collaborate with the software. This statement may seem clichéd and obvious, yet it is one of those critical issues that are mostly overlooked. For example, let us take that the most pressing issue for your urgency in buying a CRM is to facilitate communication with your customers. Therefore, communication should be the make or break feature for purchasing your CRM system. Therefore, do not get caught up with other fancier aspects of the CRM software if you find your desired CRM lacks the ideal communication features while purchasing the CRM. Always keep in your mind that the software solution that you select for your business must be accurate and effective in addressing your problems. However, we have seen that it is not uncommon for companies to select CRM solutions that do not necessarily address their pressing issues. Hence, the primary problem the software solution is expected to resolve should always be there at the top of your checklist before buying your Merchant Cash Advance CRM. In any sort of businesses, most companies can very quickly identify at least two time-taking business processes when it comes to managing their customer relationships. Therefore, before finalizing carefully map these burdensome processes and match the ideal CRM solution that is capable of streamlining these cumbersome issues. Remember, you selected CRM must always save your business resources and time to justify its ROI to the company. There can be several scenarios and you can be a part of any one or more of these issues. Like, you can have access to manage an in-house team of IT professionals or you may have limited access to reliable professionals and resources that can solve your IT problems as they arise, or you may even have access to IT resources but they do not align with the particular needs for a given CRM solution. Therefore, when selecting your CRM system, always take into account the potential support requirements of the skillsets that you require from your technical team before purchasing the CRM software. Last but not the least, the most common mistake that businesses make while opting for a CRM system is to make a selection even before scheduling a demo of the software. Ideally, you should consider evaluating several CRM solutions simultaneously before selecting your preferred CRM software. Most CRM brands offer a walkthrough or a free trial to their prospects. Remove guesswork before selecting your CRM. We are confident that if you are capable of avoiding these common pitfalls in choosing your CRM, this article will help you to find the right CRM solution for your Merchant Cash Advance businesses.